33 mm 18-ct pink gold case, transparent back, 18-ct pink gold crown set with a ruby cabochon and diamond, sapphire crystal, black dial, automatic movement, 18-ct pink gold bracelet. 33 mm 18-ct pink gold case set with diamonds, 18-ct pink gold crown set with a pink cabochon and diamond, diamond bezel, black opaline dial with a guilloche soleil treatment set with diamond indexes, automatic movement, 18-ct pink gold bracelet set with diamonds. 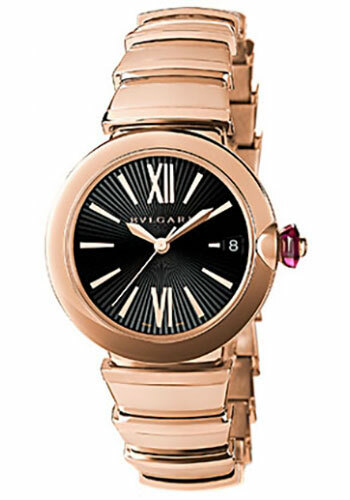 33 mm 18-ct pink gold case, 18-ct pink gold crown set with a pink cabochon and diamond, diamond bezel, sapphire crystal, black dial, automatic movement, 18-ct pink gold bracelet. 33 mm 18K pink gold case, 18K pink gold crown with a cabochon cut pink stone and diamond, silver Opaline dial with a guilloché soleil treatment and rhodium plated index, automatic movement with date, hour minute, seconds functions, alligator strap, 18K pink gold ardillon buckle. 33 mm 18K pink gold case set with brilliant cut diamonds, 18K pink gold crown with a cabochon cut pink stone and diamond, Silver satiné soleil dial set with diamond indexes, automatic movement with date, hour minute, seconds functions, 18K pink gold ardillon buckle. 33 mm 18-ct pink gold case, transparent back, 18-ct pink gold crown with a ruby cabochon and a diamond, sapphire crystal, mother of pearl dial set with diamond hour markers, automatic movement, 18-ct pink gold bracelet, folding buckle. Water resistant to 150 ft.